Ani's Book Abyss: My TBR List -- August Winner! Crash and Burn won with 50% votes! This month was a slow one for votes, and a close one as well. And to be totally honest, I'm very happy with the results. While My Lady, My Lord lagged behind, Crash and Burn and Endsinger had 4 and 3 votes each, respectively. In a way, I was hoping for more votes, but I was also dreading more votes because I was afraid that Endsinger would tie with Crash and Burn and I'd have to read two books. Then again, I need to read four books for my Reading Assignment anyway, so I guess it wouldn't have been so bad. 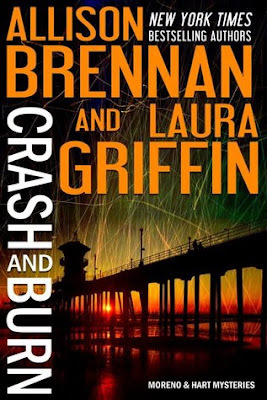 8/27/2016: Review of the winning book, Crash and Burn. Hope you enjoy it and can't wait to see what you think!! Thanks. I'm about 20% in right now, and it looks like the book is divided into two, like a mini-anthology. The first part is written by Allison Brennan, whom I've only had a one book experience with and didn't really care for much. So I'm looking forward to the second part, written by Laura Griffin, whom I love! Thanks! So far it's not bad and the action has already started. Allison Brennan writes the first part, so I'm looking forward to the next part written by Laura Griffin. Crash and Burn sounds like it will be intense! I hope you enjoy it. I nearly ended up with a tie. It turned out to be really close up until the last minute. Have a great week! So far it's pretty good, but nothing too exciting yet. The first part of the book is written by Allison Brennan, following on the of P.I.s, Scarlet Moreno. My one book experience with Allison Brennan in the past was kind of 'meh'. The next part will be written by Laura Griffin, whom I love. I don't think this was the one I voted for, but it looks good! It sure won with overwhelming odds. It's pretty good so far. But to be honest, I used the words "won by 50%" cause it sounded more impressive. :P In reality, it really won by one vote, with Endsinger very close behind--4 to 3. My Lady, My Lord got 1 vote. I didn't have as many voters this month, so the numbers are actually quite small.